On Sunday we did something that Rick has been wanting to do for a long time now and that is meet up with the Miata club for a drive, or a "run" as they call it. Most of the runs have been too far away with the southern New Jersey club, or the other club that we knew of in Pennsylvania was too far as well. When he heard of the Del-Val (Delaware Valley) club's run on Sunday and it was only a one and one-half hour drive for us to meet up with them we decided to go. Our meet-up was at Hot Dog Johnny's in Buttzville, New Jersey close to the Pennsylvania border. It's a fairly famous old-fashioned hot dog stand, and goodness knows, New Jersey folks love their dogs. We sampled the dogs (mine was mustard and onions, Rick's was mustard and ketchup) with a side of fries and a delicious cold birch beer. We found the president of the Miata club and introduced ourselves, adding our name to the sign-up sheet. 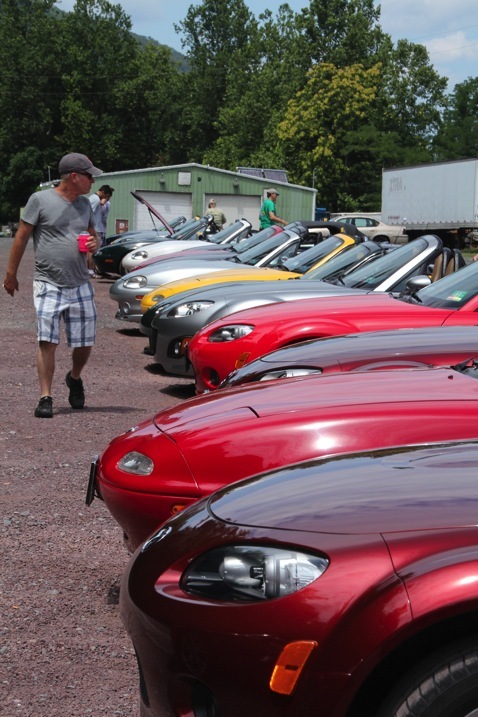 Miatas kept pouring in, filling the already full-to-bursting parking lot. Johnny's does a hopping business! We all gathered around for our driving instructions and a brief go-over of the run. It all seemed pretty well planned. The lead driver had a CB radio, as did a person mid-pack, and the person bringing up the rear would have a CB too so that we could all stay together, even if we got separated. 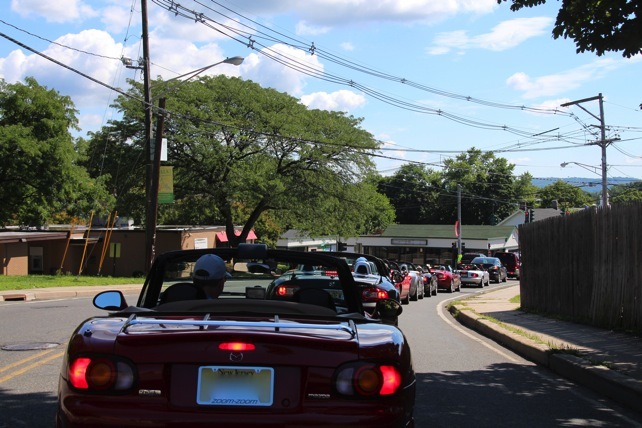 Staying together seemed pretty unlikely to me since I counted 25 Miatas joining our little sports car parade. We pulled out of the parking lot en masse as best we could with traffic conditions with Rick and I ending up fourth in the pack, then a little way down the road we all pulled off to let everyone catch up. Once we were all together, we were off! The drive along the Delaware River on the Pennsylvania side was just beautiful. We kept together pretty well and only got separated once at a stop light. Again, we all pulled over to wait. We got some strange looks from people driving by. Our mid-run stop was at an ice cream shop. We were quite the sight as we all pulled in next to each other, and still we didn't all fit side by side. The drive ended up at Childs Park near Dingmans Ferry where most people hiked a trail up to some waterfalls, but Rick and I headed home as it was getting pretty late in the afternoon and we still had the one and one-half hour drive home. All in all it was very well organized and a fun way to spend the day. The club is having another run this weekend about the same distance away, but it ends very close to where we live so we signed up for that one too. We get to see countryside we haven't seen before while finding new back roads to take, so what's not to like? On Sunday we took a drive in Mia to Milford, PA. Milford is a quaint little town right on the Delaware River. We took twisty-turny back roads the whole way there and it was a lovely drive even though the day was quite hot. I love that about where we live: you can take back roads to just about anywhere if you so choose to do so. We walked around a little, talking in the historic buildings and quaint shops but it was just too hot and stifling to do much. 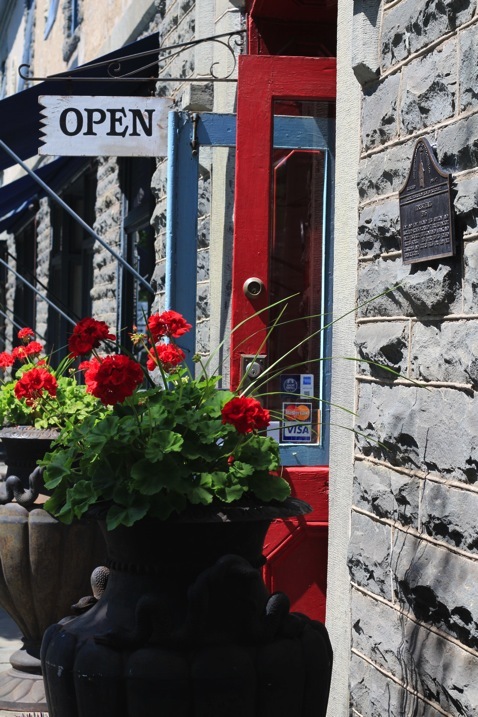 We headed to lunch at the historic WaterWheel Cafe where it seemed everyone else in town was also eating there. We waited for about 15 minutes or so before we could be seated but I really didn't mind since we got to stand right in front of the air conditioning unit. Ahhh, cool bliss! Our little table was right by the window looking into the mill and we could see the wheel turning round and round. The food was good. All in all, it was a beautiful drive and a great way to spend the day with a little convertible car.